A necessary first step for reliable chromatography sample analysis is choosing the correct vial and compatible closure components. With proper equipment and analytic procedures, this ensures that the results from your sample analyses are as accurate as possible. 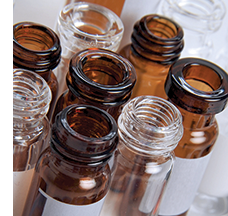 Here are a few tips for choosing the best vial for your chromatography needs. 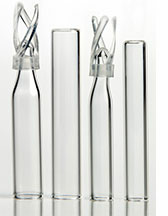 Borosilicate Glass vials are the preferred choice for gas chromatography and liquid chromatography (GC/LC). These vials are generally free of potential contaminants that may interfere with analysis of the sample. Borosilicate glass is made by adding boron trioxide to silica for extreme heat resistance with a very low expansion coefficient, withstanding temperatures in excess of 500 degrees Celsius. Being made of glass, these vials are breakable, although breakage issues are uncommon. 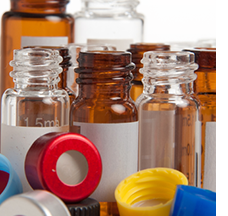 Plastic vials are lightweight, unbreakable and highly resistant to chemicals. Plastic vials are generally used for ion chromatography. They have a relatively low tolerance to heat, however: Polypropylene (PP) vials have a heat resistance up to 135 degrees Celsius, and polymethyl pentene (PMP) vials can withstand heat up to 175 degrees Celsius. Vials come in various sizes and finishes. The most common sizes for liquid injections are 12x32mm and 15x45mm vials. Depending upon the vial manufacturer, a 12x32mm vial may also be referred to as a 1.5mL vial, a 1.8mL vial, or a 2.0mL vial. 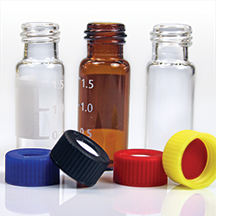 Vials also come in different finishes for closures, including crimp seal, snap cap, or screw cap closures. Screw caps come in different sizes identified by the outer diameter of the mouth of the vial. 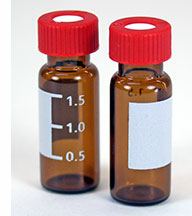 Screw caps used on chromatography vials are either 8mm, 9mm, or 10mm, with 9mm being the most popular size. Vials can have a standard opening (5mm) or wide-mouth opening (6mm) depending upon the cap type to be chosen. Always choose a vial that is appropriate for the specific instrument in use. For example, 11mm crimp and 9mm screw-cap vials will work with an Agilent® autosampler, but 11mm and 8mm screw caps will not. This is because the space between the cap and the shoulder of the vial needed for the autosampler to operate properly differs by instrument. Consult equipment specifications and manuals to determine the correct vial to use. Both glass and plastic vials can be either clear or amber in color. Amber vials offer protection for samples that could be degraded or affected by exposure to ultraviolet light. Clear vials are recommended if observation of the sample is necessary. Amber glass vials are made from 51 expansion glass, which can be heated at higher temperatures during the manufacturing process (1,200°C) while clear glass vials are made from 33 expansion glass (heated at 1,000°C during manufacturing). The vial closure components are the cap and the cap liner. 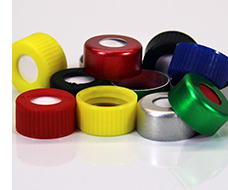 Caps are either aluminum (for crimp seals) or plastic (polyethylene, polypropylene, or a phenolic resin), for screw caps or snap caps. Aluminum crimp seals require the use of a crimping tool to assure that the cap is attached properly, as well as to remove the cap from the vial. Snap caps are chosen strictly for convenience and ease of applying the cap to the vial, such as in the case of capping hundreds of samples at a time. Screw caps, on the other hand, provide a better seal (when the cap is properly matched to the vial threading) and are therefore more reliable. Ribbed screw caps are recommended for a surer grip, resulting in a more secure seal. The cap liner is the septum that is pierced by the syringe needle to extract the sample. Cap liners (or septa) come in a variety of different configurations and materials. The base material for cap liners is usually rubber (natural or synthetic) or silicone. The liner can be faced with PTFE on one or both sides. Choose a cap liner that is compatible with your solvent. 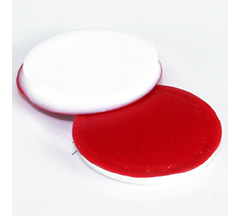 In most cases, a cap liner with PTFE on the side facing the sample is the best option. Vial cap liners can also come pre-slit, allowing for easier needle penetration, especially for larger needles typically used in LC autosamplers. For best results, choose liner material that is pigment-free with low bleed characteristics. Independent tests have shown QEC's Qromix™ silicone septa to have 60 percent better bleed performance than standard septa. Sometimes samples to be examined can be rather small or scarce, necessitating the use of Limited Volume Vial Inserts to make the most of limited sample quantity. Vial inserts come in a variety of shapes and sizes. A conical insert with a plastic spring on the bottom is preferred because the spring assures a seal with the vial cap liner. In addition, it will accommodate the autosampler syringe needle and will automatically adjust to different sampling depths. Inserts typically have an outer diameter of 5 or 6mm, so make sure to choose a vial size that will accommodate the insert. Vials with an 11mm, 10mm, or 9mm outer diameter will accommodate either size insert, but vials with an 8mm outer diameter can only use inserts that have a 5mm outer diameter. There are many vendors offering chromatography vials and closures, however quality standards are not consistent across the market. By selecting a proven brand, such as Qromix™ Chromatography by QEC, you can be assured of consistent American-made quality, as well as vials and closures that are designed to work together for maximum efficiency and protection of your sample integrity. For more information on the wide selection of Qromix™ vials, closures and septa, please contact your QEC representative, email us, or call 1-800-255-3950. © 2018 Quality Environmental Containers, Inc.